Visit the Cham Museum and explore Hoi An Ancient Town, a UNESCO World Heritage Site, where architecture influenced by traders from around the world has been largely preserved. You’ll have free time to explore the area or perhaps relax at your beach resort. The perfect ending to an unforgettable Southeast Asia river cruise vacation! Participation in this vacation requires requires purchase of the following flights from Avalon Waterways, not included in pricing: (1) roundtrip air from your U.S. gateway and intra-vacation air segments; or (2) intra-vacation air segments only, starting at $440. 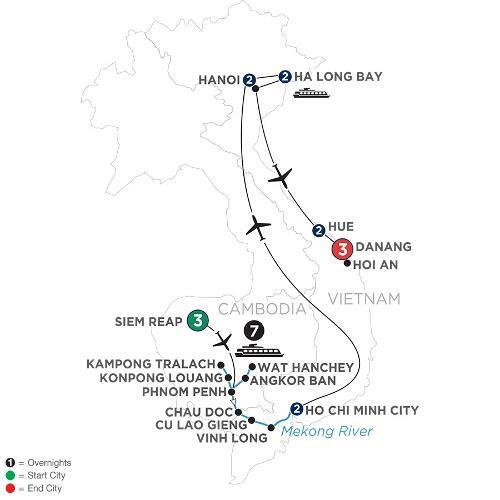 Required intra-vacation air segments: Siem Reap/Phnom Penh; Ho Chi Minh City/Hanoi; Hanoi/Hue. Air prices were effective on February 6, 2019 and their availability is limited. At the time you purchase your tour, air prices may be higher.